Durango & Ouray's premier climbing, hiking, backpacking, and skiing guide service. Operating since 1989 in the San Juan Mountains. Offering a full array of activities including rock climbing, ice climbing, alpine climbing, backcountry skiing, avalanche courses, backpacking, and hiking. With over 25 years as the Southwest's most experienced mountain guides, San Juan Mountain Guides will help you to create an unforgettable mountain journey in some of the nations most beautiful mountains - the San Juan's. Whether you are a beginner that has never climbed / hiked before, or you are a seasoned veteran looking to take your adventure to the next level, San Juan Mountain Guides is right for you. Looking for a family friendly, safe and memorable adventure? Consider one of our rock climbing tours. Even if you have never climbed before, is is safe, easy and fun! If you can climb a ladder, you can rock climb!With half day and full day adventures including rock climbing, canyoning, traversing, backpacking and more, San Juan Mountain Guides has something for every interest, budget, and experience level. Half day rock climbing at one of Durango's best rock climbing areas, East Animas. Group rock climbing is for groups of 3 or more people (per person). Appropriate for individuals with previous climbing experience. Intermediate through Advanced level climbing. Learn to rock climb with Durango's only comprehensive and most experienced professional climbing school and guide service. Rock climbing in Durango is a great option for anyone looking for some high adventure! If you're looking for more of a challenge, then the East Animas climbing area is for you. The climbs are longer and have a wider array of difficulties, and we even have a few multi-pitch climbs to really give you that airy feeling! Half day rock climbing at one of Durango's best rock climbing areas,Group rock climbing is for groups of 3 or more people (per person). East Animas. Appropriate for individuals with previous climbing experience. Intermediate through Advanced level climbing. Learn to rock climb with Durango's only comprehensive and most experienced professional climbing school and guide service. Rock climbing in Durango is a great option for anyone looking for some high adventure! No experience is necessary, and we have access to exceptional climbing terrain for people of all ages and ability levels. Group rock climbing is for groups of 3 or more people (per person). This 3 hour rock climbing trip is for beginner through intermediate rock climbers. Perfect for those who possess little or no outdoor climbing experience, as well as those who do. This is a great venue to learn the basics of rock climbing and have a lot of fun in the process. Group rock climbing is for groups of 3 or more people (per person This 3 hour rock climbing trip is for beginner through intermediate rock climbers. Perfect for those who possess little or no outdoor climbing experience, as well as those who do. This is a great venue to learn the basics of rock climbing and have a lot of fun in the process. 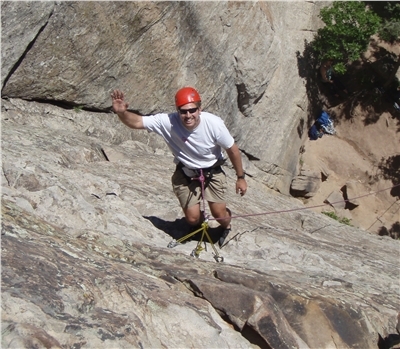 Half day private 1:1 rock climbing instruction at East Animas rock climbing area. Intermediate through Advanced level climbing. Learn to rock climb with Durango's only comprehensive and most experienced professional climbing school and guide service. 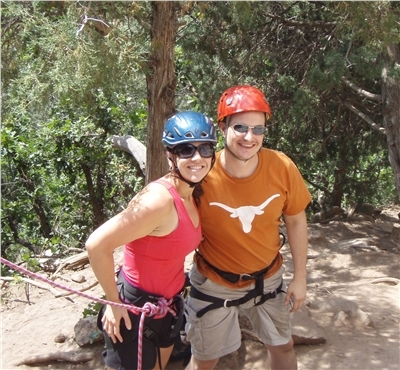 Rock climbing in Durango is a great option for anyone looking for some high adventure! If you're looking for more of a challenge, then the East Animas climbing area is for you. The climbs are longer and have a wider array of difficulties, and we even have a few multi-pitch climbs to really give you that airy feeling! Private 1 on 1 half day rock climbing instruction at X-Rock climbing area. Learn to rock climb with Durango's only comprehensive and most experienced professional climbing school and guide service. Rock climbing in Durango is a great option for anyone looking for some high adventure! No experience is necessary, and we have access to exceptional climbing terrain for people of all ages and ability levels. Appropriate for all ages and ability levels and no experience necessary. Half day semi-private 1:2 rock climbing instruction at East Animas rock climbing area. Intermediate through Advanced level climbing. Learn to rock climb with Durango's only comprehensive and most experienced professional climbing school and guide service. Rock climbing in Durango is a great option for anyone looking for some high adventure! If you're looking for more of a challenge, then the East Animas climbing area is for you. The climbs are longer and have a wider array of difficulties, and we even have a few multi-pitch climbs to really give you that airy feeling! Semi-Private 1:2 half day rock climbing instruction at X-Rock climbing area. Learn to rock climb with Durango's only comprehensive and most experienced professional climbing school and guide service. 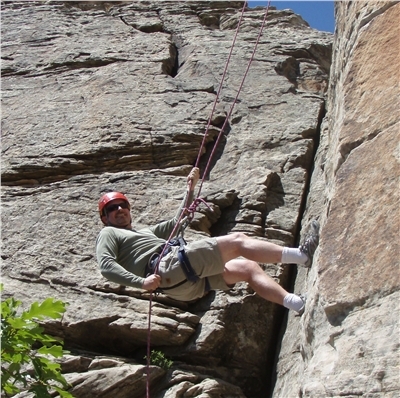 Rock climbing in Durango is a great option for anyone looking for some high adventure! No experience is necessary, and we have access to exceptional climbing terrain for people of all ages and ability levels. Semi Private 1:2 half day rock climbing instruction at X-Rock climbing area. Learn to rock climb with Durango's only comprehensive and most experienced professional climbing school and guide service. Rock climbing in Durango is a great option for anyone looking for some high adventure! No experience is necessary, and we have access to exceptional climbing terrain for people of all ages and ability levels. Semi-Private 1:2 rock climbing instruction at East Animas rock climbing area. Semi-Private 1:2 rock climbing instruction at X-Rock climbing area. Your ice climbing experience includes: two people to one guide, a full-day of instruction, and your climbing equipment (ropes, ice screws, etc.) harness, helmet, ice tools, crampons and ice boots. Your ice climbing experience includes: three people to one guide, a full-day of instruction, and your climbing equipment (ropes, ice screws, etc.) harness, helmet, ice tools, crampons and ice boots. 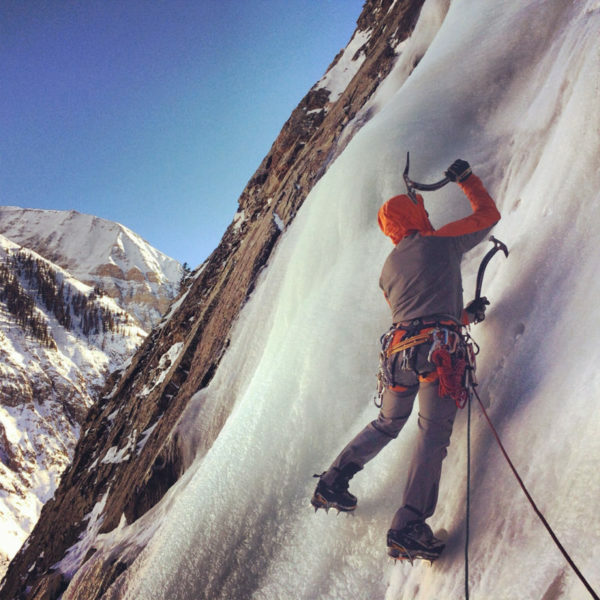 Your ice climbing experience includes: four people to one guide, a full-day of instruction, and your climbing equipment (ropes, ice screws, etc.) harness, helmet, ice tools, crampons and ice boots. Your ice climbing experience includes: one person to one guide, a full-day of instruction, and your climbing equipment (ropes, ice screws, etc.) harness, helmet, ice tools, crampons and ice boots. Your ice climbing experience includes: one person to one guide, a half-day of instruction, and your climbing equipment (ropes, ice screws, etc.) harness, helmet, ice tools, crampons and ice boots. Your ice climbing experience includes: two people to one guide, a half-day of instruction, and your climbing equipment (ropes, ice screws, etc.) harness, helmet, ice tools, crampons and ice boots. 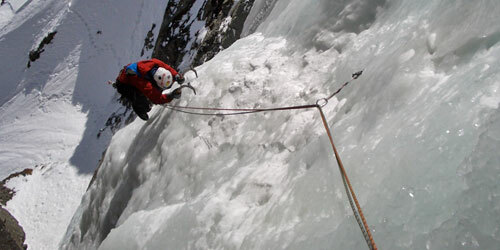 Your ice climbing experience includes: three people to one guide, a half-day of instruction, and your climbing equipment (ropes, ice screws, etc.) harness, helmet, ice tools, crampons and ice boots. 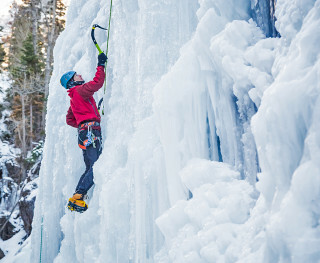 Your ice climbing experience includes: four people to one guide, a half-day of instruction, and your climbing equipment (ropes, ice screws, etc.) harness, helmet, ice tools, crampons and ice boots. Celebrating 26 years of trips, tours, and courses in Ouray and the San Juans! Learn to rock climb with Ouray's only comprehensive and most experienced professional climbing school and guide service. 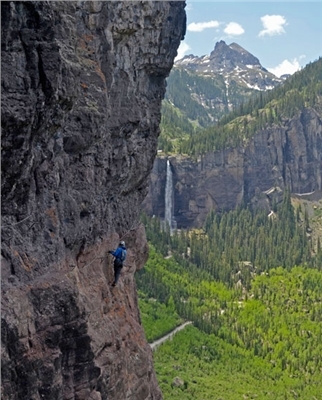 Rock climbing in Ouray is a great option for anyone looking for some high adventure! No experience is necessary, and we have access to exceptional climbing terrain for people of all ages and ability levels. We offer discounts for families and organized groups of 4 or more, so please call ahead to book your rock climbing trip with us while you're in Ouray! Celebrating 26 years of trips, tours, and courses in Ouray and the San Juans! Learn to rock climb with Ourayâ€™s only comprehensive and most experienced professional climbing school and guide service. 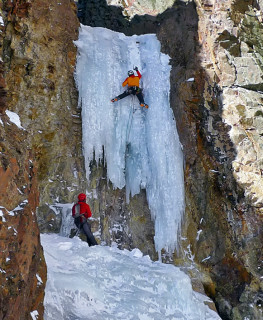 Rock climbing in Ouray is a great option for anyone looking for some high adventure! No experience is necessary, and we have access to exceptional climbing terrain for people of all ages and ability levels. We offer discounts for families and organized groups of 4 or more, so please call ahead to book your rock climbing trip with us while youâ€™re in Ouray! Private 1:1 rock climbing instruction at East Animas rock climbing area. Private 1:1 rock climbing instruction at X-Rock climbing area. Full day Rock Climbing at East Animas in Durango. Group rock climbing is for groups of two or more people (per person). Full day rock climbing adventure at the X-Rock climbing area. Group rock climbing is for groups of two or more people (per person). Can you climb a ladder? Are you excited to try new things? This would be awesome for you! 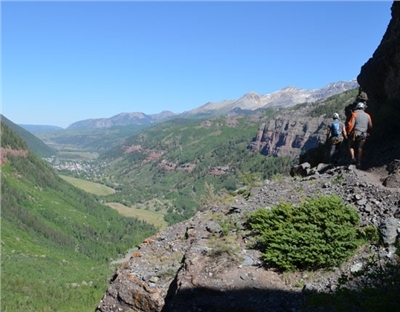 The Telluride Via Ferrata is appropriate for all ages and ability levels and is a great group or family outing. 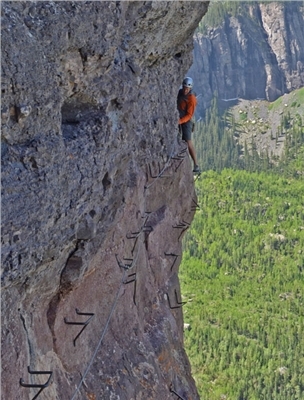 There are no prerequisites for the Telluride Via Ferrata trip. All you need is a great attitude, sense of adventure, and the gear. We'll take care of the rest! The Telluride Via Ferrata is San Juan Mountain Guides' newest offering and this trip has the potential to be the highlight of your vacation to the majestic San Juan Mountains. 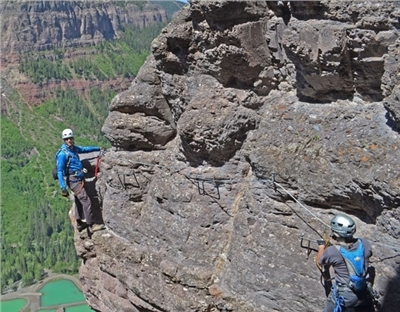 Set above the quaint mountain town of Telluride, this unique adventure combines all the best elements of mountain hiking and the classic via ferrata ladder/cable systems. Via Ferrata â€“ which is Italian for "iron road" â€“ offers the ability for participants to experience the thrill of traveling through the mountains in an exposed setting with the protection of cables and steel/iron rungs. Though quite popular throughout the European Alps, the sport is just starting to gain notice here in America. Originally developed during the first World War to aid the progress of troops through the mountains, Via Ferrata are now widely recognized as inspired tourist attractions on mountain features that would otherwise be inaccessible. The position and setting of the Telluride Via Ferrata cannot be beat. Breathtaking views of the town of Telluride, the surrounding mountains, and the iconic Bridal Veil Falls, dominate the scenery on this must-do adventure. This trip is accessible to avid hikers with a sense of adventure and is appropriate for all ages and ability levels. In Ouray: 725 Main Street. Cancellation | For single day trips or courses, cancellation must be made 48 hours prior to the first day of trip or course, otherwise your deposit will be forfeited. You can apply your trip deposit or fee toward a future trip or course that takes place within one year for a 15% fee. No credits or refunds for no shows or those leaving early. For multi-day trips or courses, cancellation must be made 45 days prior to the first day of the trip or course. Deposit | A 50% deposit is required for all reservations. The balance will be due on the first day of the course or trip.